(Nanowerk News) A Duke University team has found that nanoparticles called single-walled carbon nanotubes accumulate quickly in the bottom sediments of an experimental wetland setting, an action they say could indirectly damage the aquatic food chain. The results indicate little risk to humans ingesting the particles through drinking water, say scientists at Duke’s Center for the Environmental Implications of Nanotechnology (CEINT). But the researchers warn that, based on their previous research, the tendency for the nanotubes to accumulate in sediment could indirectly damage the aquatic food chain in the long term if the nanoparticles provide “Trojan horse” piggyback rides to other harmful molecules. 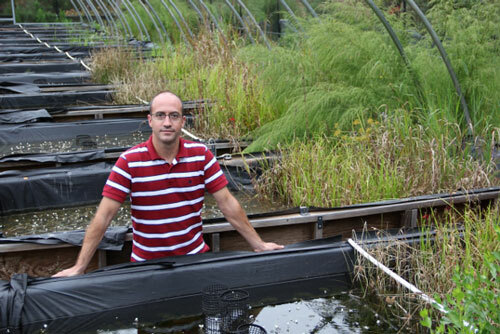 Nanotechnology researcher Lee Ferguson stands amid a collection of simulated wetlands called mescosms at Duke University. Each wetland-in-a-box is used to run the experiment under varying conditions. The results appear online in the journal Environmental Science: Nano ("Fate of single walled carbon nanotubes in wetland ecosystems"). Carbon nanotubes are rapidly becoming more common because of their usefulness in nanoelectric devices, composite materials and biomedicine. The Duke study was done using small-scale replications of a wetland environment, called "mesocosms," that include soil, sediments, microbes, insects, plants and fish. These ecosystems-in-a-box are “semi-closed,” meaning they get fresh air and rainwater but don’t drain to their surroundings. While not perfect representations of a natural environment, mesocosms provide a reasonable compromise between the laboratory and the real world. Ferguson and his colleagues dosed the mesocosms with single-walled carbon nanotubes and measured their concentrations in the water, soil and living organisms during the course of a year. They found that the vast majority of the nanoparticles quickly accumulated in the sediment on the “pond” floor. However, they found no sign of nanoparticle buildup in any plants, insects or fish living in the mesocosms. While this is good news for humans or other animals drinking water after a potential spill or other contamination event, the accumulation in sediment does pose concerns for both sediment-dwelling organisms and the animals that eat them. Previous research has shown that carbon nanotubes take a long time to degrade through natural processes -- if they do at all -- and any chemical that binds to them cannot easily be degraded either. “These nanoparticles are really good at latching onto other molecules, including many known organic contaminants,” said Ferguson. “Coupled with their quick accumulation in sediment, this may allow problematic chemicals to linger instead of degrading. The nanoparticle-pollutant package could then be eaten by sediment-dwelling organisms in a sort of ‘Trojan horse’ effect, allowing the adsorbed contaminants to accumulate up the food chain. This research was supported by the National Science Foundation, the Environmental Protection Agency under the National Science Foundation cooperative agreement EF-0830093, the Center for the Environmental Implications of Nanotechnology and the Environmental Protection Agency’s Science to Achieve Results (STAR) program (RD833859).